As the U.S. mission in Afghanistan evolves from full spectrum combat operations to a support role in helping Afghan forces take hold of their countrys security, unit commanders emphasize the need for network mobility. Warfighter Information Network-Tactical, or WIN-T, Increment 2, the Armys improved tactical network communications backbone, was designed to fulfill such a mission. The mobile WIN-T Increment 2 network is being fielded as part of the Armys new capability sets. Capability Set 13, or CS 13, is the first of these fully-integrated fielding efforts, which are scalable and tailorable in design to support the changing requirements of current and future missions. CS 13 includes radios, satellite systems, software applications, smartphone-like devices and other network components that provide connectivity from the stationary command post to the commander on-the-move to the dismounted Soldier. WIN-T Increment 2 is the tactical communications network backbone that binds the capability sets together. The Army began fielding CS 13 in October 2012 to 3rd BCT, 10th Mountain Division, which is based at Fort Drum, and to the 4th BCT, 10th Mountain Division, at Fort Polk, Louisiana. The two units are training with these advanced capabilities and preparing for possible deployment to Afghanistan with them later this year. The 101st Airborne Division (Air Assault) Headquarters has already been fielded with WIN-T Increment 2 elements, and two BCTs from the 101st are slated for full CS 13 fielding later this year. If called upon to deploy, Army BCTs armed with CS 13 capabilities will serve as Security Forces Advisory and Assist Teams, or SFAATs, who will work with Afghan National Security Forces to improve their capability and help the Afghans secure their country as coalition forces reduce their presence. The coalition forces footprint continues to decrease and many of the forward operating bases and fixed sites used to access the network are being dismantled. When it comes to combating the communication challenges created by Afghanistans harsh and expansive terrain, WIN-T Increment 2 provides an advantage over previous capability. It enables communication signals to better reach over mountains and across deserts, said Capt. Jesse Ellis, commander of C company, 3rd Brigade Special Troops Battalion. A Lockheed Martin-led industry team has completed successful functional integration tests of the spacecraft bus and network communications equipment on the first satellite of the next generation Global Positioning System, known as GPS III. The recent testing of GPS III space vehicle 1 (SV 1) busthe portion of the space vehicle that carries mission payloads and hosts them in orbitassured that all bus subsystems are functioning normally and ready for final integration with the satellites navigation payload. Systems tested included: guidance, navigation and control; command and data handling; on-board computer and flight software; environmental controls; and electrical power regulation. The SV 1 satellites network communication equipment subsystem that interfaces with the ground control segment and distributes data throughout the space vehicle also passed all tests as expected. This milestone follows Februarys successful initial power-on of SV 1, which demonstrated the electrical-mechanical integration, validated the satellites interfaces and led the way for functional and hardware-software integration testing. The successful completion of the SV 1 bus functional check out validates that the spacecraft is now ready to begin the next sequence of payload integration and environmental testing, prior to delivery, said Keoki Jackson, vice president of Lockheed Martins Navigation Systems mission area. GPS III SV 1s navigation payload, which is being produced by ITT Exelis, will be delivered to Lockheed Martins GPS Processing Facility (GPF) near Denver later in 2013. The hosted nuclear detection system payload has already been delivered and mechanically integrated. 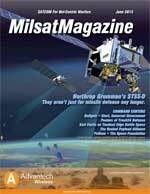 The satellite remains on schedule for flight-ready delivery to the U.S. Air Force in 2014. GPS III is a critically important program for the Air Force, affordably replacing aging GPS satellites in orbit, while improving capability to meet the evolving demands of military, commercial and civilian users. GPS III satellites will deliver three times better accuracy and, in order to outpace growing global threats that could disrupt GPS service, up to eight times improved anti-jamming signal power for additional resiliency. The GPS III will also include enhancements adding to the spacecrafts design life and a new civil signal designed to be interoperable with international global navigation satellite systems. Lockheed Martin is currently under contract for production of the first four GPS III satellites (SV 1-4), and has received advanced procurement funding for long-lead components for the fifth, sixth, seventh and eighth satellites (SV 5-8). The GPS III team is led by the Global Positioning Systems Directorate at the U.S. Air Force Space and Missile Systems Center. Lockheed Martin is the GPS III prime contractor with teammates ITT Exelis, General Dynamics, Infinity Systems Engineering, Honeywell, ATK and other subcontractors. Air Force Space Commands 2nd Space Operations Squadron (2SOPS), based at Schriever Air Force Base, Colorado, manages and operates the GPS constellation for civil and military users. COM DEV International Ltd. has completed delivery of a fourth flight set of hardware for the U.S. Air Forces Advanced Extremely High Frequency (AEHF) protected military satellite communications program. Advanced EHF is the next generation of protected military satellite communications satellites and provides vastly improved global, survivable, highly secure, protected communications for strategic command and tactical military personnel operating on ground, sea and air platforms. COM DEV is under contract to Northrop Grumman Aerospace Systems, to supply six flight sets of electromechanical switches, passive microwave filters and Beam Select Switch assemblies. Beam Select Switch assemblies provide high-speed switching, selectable attenuation and filters that reject undesired signals and provide the ability to adjust the level of the transmitted signals. The fifth and sixth flight sets of AEHF hardware are currently in production at COM DEVs facilities at Cambridge, Ontario and Aylesbury, U.K. The AEHF team includes the U.S. Air Force, Lockheed Martin Space Systems Company in Sunnyvale, California, as the AEHF prime contractor, space and ground segments provider as well as system integrator, with Northrop Grumman Aerospace Systems in Redondo Beach, California, as the payload provider.